How Does Working Memory In The Brain Actually Work? : Shots - Health News Working memory is where the brain keeps bits of information in everyday life handy. But brain scientists don't agree on how working memory works. 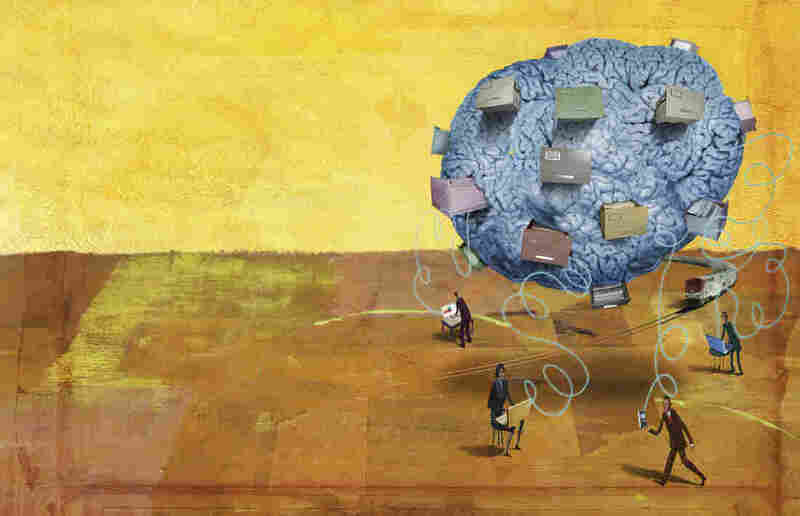 Neuroscientists Debate A Simple Question: How Does The Brain Store A Phone Number? You hear a new colleague's name. You get directions to the airport. You glance at a phone number you're about to call. These are the times you need working memory, the brain's system for temporarily holding important information. "Working memory is the sketchpad of your mind; it's the contents of your conscious thoughts," says Earl Miller, a professor of neuroscience at MIT's Picower Institute for Learning and Memory. It's also "a core component of higher cognitive functions like planning or language or intelligence," says Christos Constantinidis, a professor of neurobiology and anatomy at Wake Forest School of Medicine. Miller and Constantinidis agree that working memory is critical to just about everything the brain does. They also agree that problems with working memory are a common symptom of brain disorders such as autism and schizophrenia. But they are on opposite sides of a lively debate about how working memory works. Both scientists are presenting evidence to support their position at the Society for Neuroscience meeting in San Diego this week. They also faced off with dual perspectives in the Journal of Neuroscience in August. Constantinidis backs what he calls the standard model of working memory, which has been around for decades. It says that when we want to keep new information like a phone number, neurons in the front of the brain start firing — and keep firing. "And it is this persistent activity of neurons in the prefrontal cortex that allows you to maintain this information in memory," Constantinidis says. If the firing stops, he says, the memory is gone forever. But Miller contends it's not that simple. His team used the latest technology to study groups of neurons in working memory. And they found that instead of firing persistently, most of these neurons were firing in brief, coordinated bursts. "This doesn't sound like a big difference," Miller says. "But actually it has huge functional implications." One of those implications is that the brain must have some way of retaining the bits of information in working memory during the lulls in activity between bursts. Miller's hypothesis is that the neurons in working memory are communicating with other parts of the brain, including the networks involved in long-term memory. The neurons do this by firing together at specific frequencies, which leaves a temporary "impression" of the information in vast networks of brain cells. Miller's model would allow information from working memory to be stored in a latent form, much the way long-term memories are stored. And that could explain how we are able to keep a phone number in mind, even if we get distracted momentarily. "If you drop your coffee on the way to the phone, [the] activity in your brain switches to the dropping of the coffee," Miller says. "But then because these memories are stored in latent form, they can be reactivated." If working memory really does interact with other parts of the brain in this way, it could explain how areas involved in planning and decision-making are able to control what information stays in working memory and what gets deleted. "It opens up what is the most difficult but the most exciting question about working memory, which is volition," Miller says. "How do you gain control over your own thoughts?" Miller's model of working memory is "very attractive on theoretical grounds," Constantinidis says, because it explains some things that are hard to explain with the standard model. And Miller and others have made an important contribution to the field by detecting the bursts of activity from working memory neurons, he says. "The problem with the theory is that so far there has been no experimental evidence linking this critical variable with behavior," Constantinidis says. And some studies suggest there is no link. For example, he says, lab experiments suggest that the amount of rhythmic firing going on doesn't seem to have much effect on working memory performance. Also Miller's contention that working memory is linked to long-term memory seems at odds with doctors' experience with patients whose brains have been injured, Constantinidis says. "We have clinical cases of patients for whom working memory is profoundly impaired and yet their long-term memory is intact," he says. So for the moment, Constantinidis is standing by the standard model. And he plans to take a skeptical look at the research Miller's lab is presenting at the neuroscience meeting. "As scientists that's what we do," he says. "We try to poke holes in each other's theories. And that's what makes science fun." For his part, Miller says a growing number of brain scientists are embracing his model of working memory, and doing the experiments that will show whether it's correct.